بخشنده امنیه, حسن, سیامکی, علی. (1391). طراحی الگوی انفجار با استفاده از بسامد غالب و بیشینه مجاز سرعت ذرات. مجله ژئوفیزیک ایران, 6(2), 20-29. حسن بخشنده امنیه; علی سیامکی. "طراحی الگوی انفجار با استفاده از بسامد غالب و بیشینه مجاز سرعت ذرات". مجله ژئوفیزیک ایران, 6, 2, 1391, 20-29. بخشنده امنیه, حسن, سیامکی, علی. (1391). 'طراحی الگوی انفجار با استفاده از بسامد غالب و بیشینه مجاز سرعت ذرات', مجله ژئوفیزیک ایران, 6(2), pp. 20-29. بخشنده امنیه, حسن, سیامکی, علی. طراحی الگوی انفجار با استفاده از بسامد غالب و بیشینه مجاز سرعت ذرات. 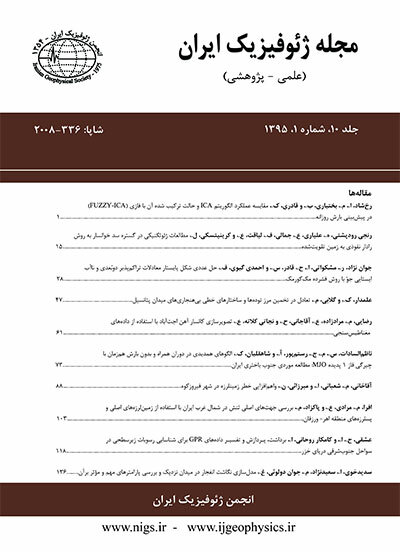 مجله ژئوفیزیک ایران, 1391; 6(2): 20-29. همة انرژی حاصل از انفجار صرف خرد شدن توده‌سنگ نمی‌‌شود و بخش زیادی از آن صرف ایجاد لرزش زمین، انفجار هوا، پرتاب سنگ و مانند آن می‌‌شود. لرزش زمین حاصل از انفجار، همواره تهدیدی جدی برای سازه‌‌ها و منازل مسکونی اطراف محل انفجار به‌شمار می‌رود. از پارامترهای مهم در ارزیابی میزان لرزش زمین و خسارات وارده حاصل از انفجار، حداکثر سرعت ذرات و بسامد است. روابط عرضه شده برای طراحی الگوی انفجار براساس ویژگی‌‌های توده‌سنگ یا ماده منفجره است و در آنها تاثیر موج انفجار نادیده گرفته می‌شود. در این مقاله با استفاده از شبکه عصبی مصنوعی داده‌‌های ثبت شده در معدن مس سرچشمه مورد آموزش قرار گرفت. در این شبکه پارامترهای فاصله از محل انفجار، حداکثر سرعت ذرات، بسامد غالب، چگالی ماده منفجره و حجم بلوک استخراجی درحکم ورودی و پارامترهای الگوی انفجار (فاصله ردیفی چال‌‌ها، فاصله چال‌‌ها در یک ردیف و وزن کل خرج مصرفی) خروجی شبکه هستند. شبکه با استفاده از الگوریتم پس‌‌انتشار خطا و با آرایش 3×10×12×14×16 آموزش داده شده است. به‌منظور کسب اطمینان از آموزش، شبکه براساس داده‌‌های کنترل، مورد آزمایش قرار گرفت و دستیابی به ضریب همبستگی 82/0، 71/0 و 76/0 به‌‌ترتیب برای وزن کل خرج، فاصله ردیفی چال‌‌ها و فاصله چال‌‌ها در یک ردیف ممکن شد. The energy released from an explosion propagates through the surrounding rock-mass in wave forms, causing structural vibrations in the vicinity of the explosion blocks. The waves are spread as body as well as surface waves. Resonance occurs when the frequency of the explosion wave is the same as the associated structures, leading to increase the damage to them. Hence, in designing the explosion patterns, the allowable peak particle velocity of these structures should be considered. Several correlations (Pears, 1955; Allsman, 1960; Speath, 1960) presented in the literature, express the parameters involved in evaluating the explosion effects including the explosive characteristics and the rock-mass strength. Ash (1968), proposed a simple relation based on the diameter of blast-hole to determine the burden required and Livingston (1956) suggested a relation on the basis of “crater theory” to determine the spacing. However, the influence of blast-wave has not been considered in the conventional explosion design patterns. In this study, a neural network was trained in order to design a explosion pattern based on the maximum allowable vibration. This network tried to design a blasting pattern by special attention to the allowable peak particle velocity and the natural frequencies of the buildings adjacent to blasting area. For this purpose, the ground vibration data from 11 blasts were recorded by PDAS-100 digital seismographs and 3-C L-4C seismometers. Seismographs were installed in three vertical, tangential and radial directions. 47 of the recorded vibrations were employed in a neural network training which used a back propagation algorithm for training. The network consisted of four hidden layers and one output layer composed of three neurons. The training algorithm of each hidden layer was a Levenberg- Marquardt designed to approach a second-order training speed without having to compute the Hessian matrix; Tan-sigmoid transfer function was employed for the hidden layers and a linear transfer function pureline was used for the output layer. For adequate network training process, a series of appropriate response should be ensued. During the training, in order to minimize the performance, the network weights and biases were corrected. In this study the network performance was evaluated using a mean-square error when compared to the output and the real data. The input parameters included the peak particle velocity, frequency, volume of the extraction block and the explosive density, while the outputs included the burden, spacing and the total charge weight. The other parameters of the blasting pattern such as stemming, sub-drilling were calculated by empirical equations and the blasting delay was determine by the blasting designer. The network was trained successfully at the 8920th epoch with a mean square error of 6.19´10−16. To ensure correct training, the network was tested using the test data and was able to achieve the total charge weight, burden and spacing with coefficient correlations of 0.65, 0.77 and 0.96, respectively. امینی، ن. و جواهریان، ع.، 1389، مدل‌سازی انتشار امواج در محیط اکوستیکی دوبُعدی به روش تفاضل محدود متناهی در حیطه فرکانس، مجله ژئوفیزیک ایران، 4(1)، 1-16. بخشنده امنیه، ح.، 1378، پیش‌بینی اثرات ناشی از انفجار معادن روباز بر روی سازه‌‌های سطحی مجاور، پایان نامه کارشناسی ارشد، دانشگاه صنعتی امیرکبیر. جواهریان، ع. و بخشنده امنیه، ح.، 1381، بررسی روابط تجربی پیش‌بینی حداکثر سرعت ذرات در انفجارهای معدن سنگ آن گل گهر، نشریه علمی پژوهشی فیزیک زمین و فضا، 28(1)، 21-30. روشندل کاهو، ا. و سیاه‌کوهی، ح.، 1388، تعیین فاکتور کیفیت با تبدیل‌‌های زمان-مقیاس و زمان- فرکانس، مجله ژئوفیزیک ایران، 3(1)، 19-32. Bakhshandeh Amnieh, H., Mozdianfard, M. R. and Siamaki, A., 2010, Predicting of blasting vibrations in Sarcheshme copper mine by neural network: Safety Science, 48, 319-325. Najm, K., Javaherian, A. and Bakhshandeh Amnieh, H., 2002, Study of blasting vibrations in Sarcheshmeh copper mine: Acta Seismologica Sinica, 15, 683-690. Khandelwal, M. and Singh, T. N., 2007, Evaluation of blast induced ground vibration predictors: Soil Dynamics and Earthquake Engineering, 27, 116-125. Khandelwal, M. and Singh, T. N., 2009, Prediction of blast induced ground vibration using artificial neural network: International Journal of Rock Mechanics and Mining Science, 46, 1214-1222. Mohammad, M. T., 2009, Artificial neural network for prediction and control of blasting vibrations in Assiut (Egypt) limestone quarry: International Journal of Rock Mechanics and Mining Science,46, 426-431. Singh, P. K. and Roy, M. P., 2010, Damage to surface structures due to blast vibration: International Journal of Rock Mechanics and Mining Science, 47, 949-961. The Math Works Inc, 2002, Statistics Toolbox for use with MATLAB, User’s Guide Version 4.